Island Peak climbing is 6187 metres high and one of the most popular and busy trekking peak in Nepal, also known as Imja Tse, lies in the Khumbu Himalayan range. Climbing this peak gives the best satisfaction every amateur and serious climber can dream of. If you are seeking the thrill of adventure and wish to widen your experience towards the peak climbing expedition beyond simply trekking in Nepal, this is the mountain for you. Our professionally designed itinerary offers you a couple of days extra at the same town to get acclimatized. 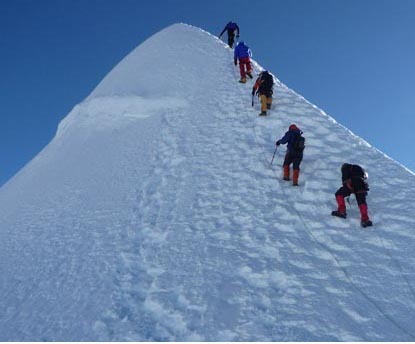 We head for Island Peak Climbing after the essential climbing practice course which is briefed and instructed by our Climbing Sherpa on various aspects of climbing techniques. Your historical effort to summit the peak will be rewarded with probably one of the best panoramic views in the world as you feel Lhotse, Nuptse, Baruntse, Ama Dablam and Makalu are almost touching the tip of your nose. Descending with a sense of achievement, our route takes us into many cultural sites, such as Pangboche, a traditional Sherpa village; Tangboche, famous for its ornately decorated Tibetan monasteries and Khumjung with Hillary school inside the clouds and mysterious Yeti scalp. If you are looking for longer trip to Island Peak climbing then our 21 days Everest Base Camp and Island Peak or 25 days Gokyo, Everest base camp and Island Peak Adventure are another options for you. Day 03 Morning fly to Lukla (2804 meters), trek to Phakding (2610 meters) 3 hours. Overnight at guesthouse. Day 04 Trek to Namche Bazaar (3441 meters) 5 hours. Overnight at guesthouse. Day 05 Namche Bazaar Acclimatization day. Overnight at guesthouse. Day 06 Trek to Tengboche Monastery (3860 meters) 5 hours. Overnight at guesthouse. Day 07 Trek to Dingboche(4350 meters) 6 hours. Overnight at guesthouse. Day 08 Trek to Chukung (4710 meters) 4 hours. Overnight at guesthouse. Day 09 Trek to Island peak base camp (5240 meters) 4 hours. Overnight at Tented Camp. Day 10 Rest and Acclimatization day Overnight at Tented Camp. Day 11 Summit to Island peak (6187meters) and return to Chhukung (4750meters) Overnight at guesthouse. Day 12 Trek to Tengboche (3860meters). 6 hours. Overnight at guesthouse. Day 13 Trek to Namche Bazaar (3441meters) via Khumjung (2780 metres) . 5 hours Overnight at guesthouse. Day 14 Trek to Lukla (2804meters)5 hours .Overnight at guesthouse. Day 15 Morning flight to Kathmandu. Overnight at hotel.